Home > News > EWG News and Analysis > How Does EWG Set a ‘Health Benchmark’ for Glyphosate Exposure? A recent set of EWG-commissioned independent laboratory tests of oat-based products found glyphosate present in 95 percent of samples made with conventionally grown oats and 31 percent of samples made with organic oats. Conventional products had much higher glyphosate levels than their organic counterparts. It is common practice for conventional oats to be sprayed with glyphosate prior to harvest, as a desiccant that kills all crops uniformly. Organic oats are not treated that way, but may become contaminated by glyphosate drifting from nearby conventional crops. Using a cancer risk assessment for glyphosate developed by California state scientists, and including additional safety factors supported by the federal Food Quality Protection Act, EWG calculated a health benchmark for the total amount of glyphosate a child might ingest in a day. 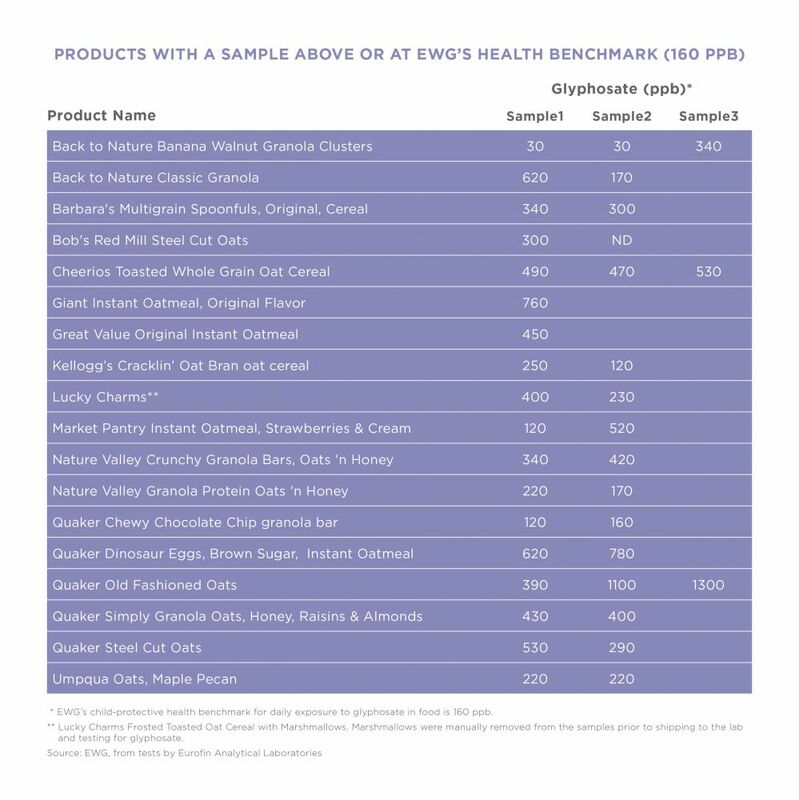 EWG’s benchmark is 0.01 milligrams per day, significantly lower than both the Environmental Protection Agency’s dietary exposure limit and California’s No Significant Risk Level. Glyphosate is classified by the International Agency for Research on Cancer, part of the World Health Organization, as probably carcinogenic to people. Glyphosate is also listed on California’s official registry of chemicals known to cause cancer, a designation just upheld by the California Supreme Court. EWG’s position is that chemicals linked to cancer do not belong in children’s food. But because we know that glyphosate is in food, it’s important to set a benchmark for the comparison of different concentrations. 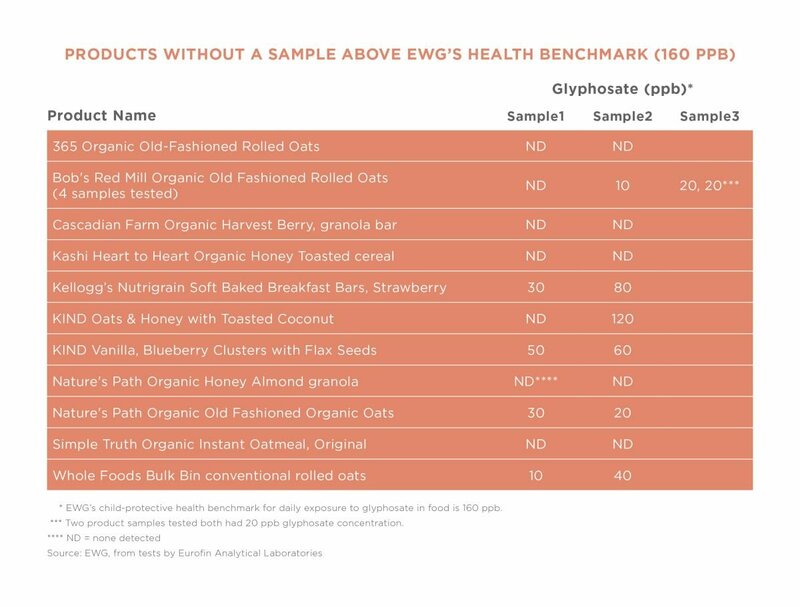 The EWG benchmark for daily glyphosate exposure would be reached by consuming 60 grams of food, equivalent to two cups of cereal, with 160 parts per billion of glyphosate. Concerns around glyphosate are tied to long-term exposure. That’s why EWG’s recent study is so important. Adults and children alike eat oat-based cereals, snack bars and oatmeal on a daily basis, and over time, those exposures add up. Below are our results, showing which products had glyphosate levels above and below our health benchmark.